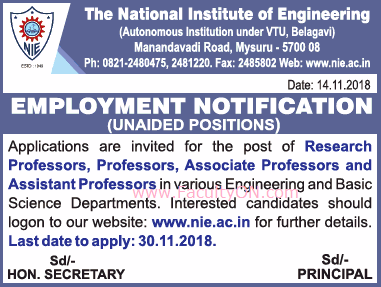 The National Institute of Engineering, Mysore has advertised in THE TIMES OF INDIA newspaper for the recruitment of Teaching Faculty- Professor / Associate Professor / Assistant Professor jobs vacancies. Interested and eligible job aspirants are requested to apply on or before 30th November 2018. Check out further more details below. About College: N.I.E. has survived various types of crisis with courage and devotion and has withstood the test of time and became really a unique Institution. We earnestly hope that the students and staff of N.I.E will emulate, now and in future, the spirit of dedication and selfless service to society. The object of the founders was not only merely to train qualified engineers with detailed knowledge of changing and up-to-date scientific discoveries, but also to make them useful citizens who would play their part in shaping the destiny of modern India”. Application Fee: Rs.500 as DD in favour of "Principal, NIE, Mysuru"
How to Apply: Interested and eligible candidates are requested to send their applications along with CV, attested copies of educational certificates / mark sheets and application fee Rs.500 as DD to the following postal address or email address.